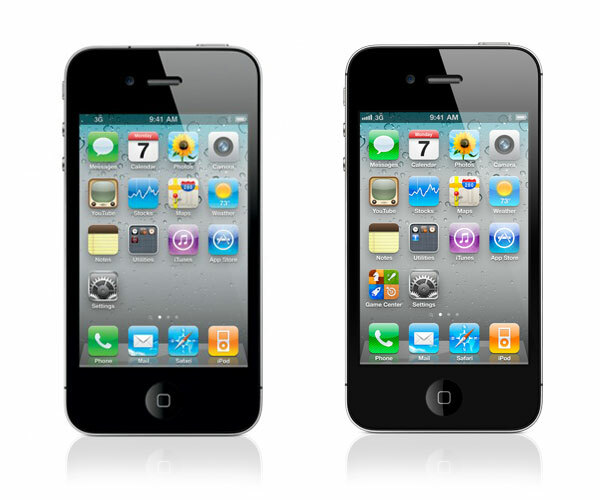 Verizon have just announced that they'll be selling a CDMA version of the iPhone 4 from February 10th. On the face of it, this news is only really exciting to US customers who don't like AT&T isn't it? Well, yes and no. As an iPhone developer, this news is of great importance to me as more iPhones being sold means more people who can buy apps. That's a good thing! However, for everyone else, the Verizon iPhone 4 has some new features that may make it into the current GSM models of the iPhone. It also points to some interesting changes possibly coming to iOS to combat the increasing functionality that Android offers. The iPhone 4 that has been shown today is different to the existing iPhone 4 in two key ways; an antenna redesign and a new "hotspot" feature. In the photo I've put together above, the current GSM version of the iPhone 4 is on the left whilst the new CDMA version is on the right. You can see on the old version that there are gaps for the antenna in the bottom corners of the phone and at the top next to the headphone jack. On the new version, however, there are a total of 4 antenna breaks with one in each corner. Not only does it look nicer, but I'm willing to bet it's been redesigned to fix the Antennagate problem that plaqued the iPhone 4 upon its release. Now that a new case has been designed, it's not beyond reason to think that Apple might silently make any new iPhone 4s they are shipping use this new case design, especially if it improves performance. Alternatively, I would expect the iPhone 5 to have the same basic design as the iPhone 4 but just have a speed boost internally (similar to the iPhone 3GS to the iPhone 3G) so this new design may be suitable for that. Time will tell I suppose! The most exciting news for most commentators is that the new iPhone 4 has a feature called Hotspot "allowing customers to use iPhone 4 to connect up to five Wi-Fi enabled devices". This is something that Android has been doing for a little while and a feature I use frequently on my Nexus S. With the current iPhone 4, you can tether via USB or Bluetooth but you generally have to pay extra for the privilege (which is a little excessive considering you've already paid for the data). It hasn't been confirmed or denied by Apple, but I wonder if we might not see this functionality introduced worldwide by adding it to the next version of iOS. I have long suspected that iOS would get an upgrade to 4.3 at some point in late January or February and so this would fit in well with the launch date of the new Verizon iPhone 4 (in that it could come bundled with iOS 4.3). Complete conjecture for the time being but it's an interesting idea and shows that Apple is willing to go head to head with Android on features. Update: Mac Rumors is now reporting that iOS 4.3 will bring hotspot support to the GSM iPhone 4 but activating it will require carrier support (and potentially charges). Update: As I predicted, Apple have release iOS 4.3 to developers with the new hotspot functionality in place. It replaces the existing internet tethering feature so still costs money on some carriers (alas). For more information, read my full article on iOS 4.3.